Were you looking for Long Term Care Insurance (insurance fraud) lawsuits? More than eight million customers in the U.S. have bought into long term care policies and the numbers are growing - baby boomers are just around the corner. Long term care insurance companies are now losing money and they are trying to prevent further losses by using questionable means to deny claims. Unfortunately, this means that people who faithfully paid their long term care insurance premiums are stuck paying for their own care, which they thought was taken care of. Send your Long Term Care Insurance Benefits Denied claim to a lawyer who will review your claim at NO COST or obligation. On March 26, 2007 the New York Times reported that thousands of policy holders have been denied benefits. One example of an insurance company acting in bad faith is Conseco. It denied an 81 year old widow benefits, even though she had paid into a long term insurance policy since 1990. The company kept coming up with one excuse after another and in the end, her family had to pay about $70,000 to a long-term care facility. Conseco didn't pay anything. This is far from an isolated case. According to the state of California, almost one in every four long-term-care claims was denied in 2005. One lawsuit alleged that John Hancock Insurance Company had tried to rescind the coverage of a 72-year-old man when he was diagnosed with Alzheimer's disease four years after buying the policy: the insurer finally settled for an unspecified amount. Policyholders have filed thousands of complaints against companies such as Conseco, its affiliate Bankers Life, Penn Treaty and John Hancock Insurance Company. Penn Treaty received one complaint for every 1,207 long-term-care policyholders -- compared with Genworth Financial, the largest long-term-care insurer that received only one complaint for every 12,434 policies, Penn Treaty has a bad track record. From its annual report, Conseco stated that its long-term care policies were not making enough money so it sold policies through Bankers Life, "using stricter underwriting and pricing standards." According to the New York Times, Conseco collected more than $4.2 billion in premiums in 2006, of which long-term-care policies contributed 21 percent. Penn Treaty collected premiums of about $320 million in 2004, mostly from long-term-care products. Even with so many policy holders filing complaints, the federal lawmakers and state regulators haven't done much to protect their citizens. Instead, insurers have persuaded insurance commissioners in California, Pennsylvania, Florida and other states to approve price increases up to 40 percent a year. said the company was delaying payment because of an investigation while failing to take steps that might have resolved the inquiry. facilities were deemed inappropriate even though they were licensed by state regulators. Not many lawsuits are made public, mainly because they have been settled with the stipulation that depositions, documents and settlement terms be kept confidential, oftentimes the insurance company has paid millions of dollars to retain confidentiality - they will go to great expense not to have their name and company image tarnished. Yet the numbers of complaints and lawsuits are growing - it's just a matter of time for lawmakers to investigate. Meanwhile, many people with long term care insurance policies can't wait that long. If you or a loved one have been denied long term care insurance benefits, please click the link below to send your complaint to an Insurance lawyer to evaluate your claim at no cost or obligation. Plaintiffs Get Settlement in Long Term Care I..
Long Term Care Insurance Claims Denied, Denie..
Conseco Update: Is Your Long-Term Care Insura..
Long Term Care Health Insurance? More likely ..
We have had LTC w/Genworth since 2000. Our contract included a no increase rate clause unless the premium class is changed. We have nevertheless experienced rate increases since GE sold. In 2016 it was 25% and now we have received a bill for 2017 that is another 42% increase. My reading of the news with class action suites against this company by its investors suggests that our rates are being raised to keep this company afloat. And, we have no assurance that the "insurance" we have paid for will be available when we need it. It is time someone took action! My wife and i had ltc policies for twenty eight ( give or take a year). The raised our premiums so much we could not afford to keep up. We are both in our mid 70's and need the insurance to look forward to. We have lost a lot of needed money to Genworth. This is not fair and we need help for some kind of remorse. We would like to join a class action suit. 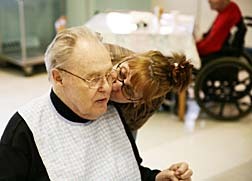 I am the caregiver for my parents and the both have a policy with Penn Treaty. For 2 months my parents have been paying me out of their savings. They have not received one payment from Penn Treaty. At first they kept adding things for me to send in to them and now we havve not heard anything from them in over 2 weeks. If there is a class action suit against Penn Treaty please let me know so that my parents can get involved. I would like to join a class action suit since my premium has gone up 60% with Genworth. After paying on a LTC policy from Prudential for 15 years we are hit with a 25% increase. The brochure states that rates are expected to stay level over your lifetime. What a croc. My premium has been raised 60% too. After 17 years of paying it. I want to join the class action suit against Genworth. We too have been hit with a 60% premium increase from Genworth on our LTCI which we have had for 14 years. In retirement it will be difficult to pay this increase. If modest increases were passed along gradually this would not have been so horrific. If a class action is being put together we would appreciate being informed. policy for long term care has increased 60%.Have paid into policy for 10 year. Seems criminal,they mismanage and make lousy estimates and policyholders must pay.Wonder if Genworth execs have taken a proportional cut in pay? I WOULD LIKE TO JOIN A CLASS ACTION SUIT AGAINST GENWORTH LONG TERM CARE POLICY. IS THERE AN ACTIVE SUIT I CAN JOIN? My husband and I both had operations and needed services at home. We can not afford to pay our premiums and for our services as well. I had two hips replaced and the restrictions placed on all patients by the surgeon prove I need the type services covered by our policy. Denied claim due to ineligibility because of no severe cognitive impairment, (she knows her name, however, cannot take her own medication due to forgetfulness, but they say this does not qualify as a cognitive impairment) and also needs proof of at least 2 activities of daily living for 90 days due to loss of functional capacity. A form was completed by her M.D. prior to her admission and was sent to Conseco. Then 90 days after being in the facility they came back and denied the claim for the above reasons. If they knew beforehand that she did not quality why did they not tell us then. I do not understand why they have to wait until the 90 days so they can deny the claim and then say you have not provided the proof but they go ahead and make you believe they will pay. Why does a review take 90 days conveniently and then when they are to start paying they have the right to deny your claim. It is a shame that these companies can do this with any time frame just because of a clause that they can refuse you any time.